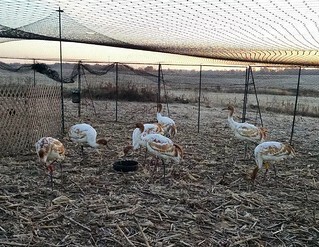 2014 Whooping cranes cohort arrives by truck this year in Carroll County, Tennessee, about two hours west of Nashville. Frigid temperatures and high winds had stalled their first ultralight-led migration. Photo taken Nov. 14, 2014 by Operation Migration. Seven young whooping cranes are making their way south in their first migration from Wisconsin being led by costumed pilots in ultralight aircraft. But the weather isn’t cooperating. 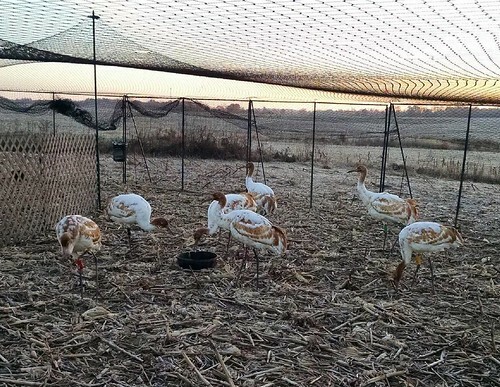 After making only 51 miles in 34 days, the team of migration experts decided to use ground transportation to move the seven endangered whooping cranes into Tennessee. The seven cranes started their first southward journey on October 10, 2014, from the White River Marsh State Wildlife Area in Green Lake County, Wisconsin, and were supposed to fly 1,117 miles south to Florida. The effects of such a long truck-borne trip on the cranes are as yet unknown, but Heather Ray of Operation Migration is pretty sure everything will work out all right. This is the longest truck-borne effort ever done by the team. The 2011 group of cranes had enough of following ultralights and were loaded aboard a truck for a short 40 miles to overwinter at Wheeler National Wildlife Refuge, Alabama. They have successfully made following migrations without a problem. The plan is to continue the migration on Sunday morning if the weather cooperates, heading south through Alabama and southeast through Georgia before finishing at St. Marks National Wildlife Refuge, on the Florida panhandle. The public can keep track of the migration at operationmigration.org/InTheField/. When coverage allows, a live videofeed from their temporary holding pen “cranecam” at: operationmigration.org/cranecam.asp. A live feed while they are in the air is also available most flights. Want to actually see them in a flyover this Sunday? Plan to wake up early and bring some hot coffee, because they depart about 10 minutes before sunrise. The viewing site is at the junction of Price Road and Long Rock Church Road outside the town of Huntingdon, Tenn. Check out the available locations for specific legs of the trip at: operationmigration.org/public-viewing-opportunities-for-o... All these flights are weather-dependent, so check the field journal the night before. This group of seven will bring the total eastern population to 104 whooping cranes. The objective is to build a flock with at least 25 breeding pairs. These seven cranes will be joining 97 whooping cranes in the eastern population (54 males, 43 females). As of Nov. 5, there were 56 in Wisconsin, 21 in Indiana, three in Illinois, three in Kentucky, three in Alabama, nine at unknown locations, one not recently reported and one long term missing. They can fly hundreds of miles in a day, so that snapshot may have changed greatly by now. Florida has about 20 in a non-migratory flock. Louisiana has a project underway for a non-migratory flock of 26 whooping cranes. The western flock has about 300 cranes, and about 130 are in captivity. The mission of the U.S. Fish and Wildlife Service is working with others to conserve, protect, and enhance fish, wildlife, plants, and their habitats for the continuing benefit of the American people. For more information on our work and the people who make it happen, visit www.fws.gov. Connect with our Facebook page at www.facebook.com/usfwssoutheast, follow our tweets at www.twitter.com/usfwssoutheast, watch our YouTube Channel at www.youtube.com/usfws and download photos from our Flickr page at www.flickr.com/photos/usfwssoutheast.